Peru is known as the home to the ancient wonder of Machu Picchu and claims a significant portion of South America’s Andes mountain range. In addition to being a tourist hotspot, Peru is an economic powerhouse laden with opportunities at both the personal and corporate level. Thousands of foreign nationals and businesses take advantage of these opportunities for employment, partnership, and expansion. Among these are Canadian nationals and businesses who, like everyone else, will be asked to provide some documentation in relation to their affairs in Peru. Documents that are issued outside of Peru need to go through a process of validation to prove to the Peruvian authorities that they are legitimate. Peru is a signatory to the Hague apostille convention and therefore uses the apostille process. However, Canada has not signed this convention and does not offer the apostille. This can be very confusing is you may have been told to get a Canadian apostille for Peru. This is not possible but there is an alternative process that Canada uses that is equal to an apostille. This process is known as authentication and legalization and was the original process of verifying foreign issued documents used by countries prior to the apostille. If you have Canadian documents that need to be used in Peru or any other foreign country, they will need to go through this process. In addition, your documents will need to be superlegalized at the Ministerio of Relaciones Exterior in Lima. Once you have completed these two separate processes, your Canadian documents will be valid for use in Peru. Authentication takes place at Global Affairs Canada and legalization takes place at the consular section of the embassy of Peru. Both are located here in Ottawa. Before either of these steps, your Canadian document must contain a signature from a recognized authority such as a Canadian lawyer, notary public, vital statistics officer, university registrar, or even select RCMP staff in order to be valid for authentication. In addition, Global Affairs Canada has other requirements that need to be met and vary from document to document. This step can take as long as 20 business days to complete. Upon completion of authentication your Canadian document is ready for legalization by the consul at the consular section of the embassy of Peru. They also have their own requirements and fees that you will need to provide. These change frequently as well as their processing time which is always uncertain. Assuming you have done the necessary research and have perfectly prepared all your documents and their associated requirements for each step of the process, it may still take you over a month to make your Canadian documents valid for use in Peru. This does not include the time it will take for superlegalization at the Ministry of Exterior Relations in Lima. The likelihood of success on the first attempt is very low even for those who are familiar with the process. Delays are very common and it’s difficult to resolve any issues that arise since Global Affairs Canada and the Peruvian embassy are frequently busy with others trying to do the same. Many affairs overseas have deadlines which makes these delays very stressful and potentially costly. We saw many Canadians struggling with this process and 25 years ago we decided to do something about it by becoming the first provider of authentication and legalization services in Canada. Since our incorporation over 2 decades ago we have helped thousands of Canadian businesses and professional individuals process their Canadian documents for use in over 100 countries including Peru. We have become experts in all manner of Canadian documents including birth certificates, marriage certificates, police checks, pension letters, certificate of pharmaceutical product, certificates of incorporation, articles of incorporation, and corporate power of attorney. The processes we developed have become the industry standards, an industry in which we have remained the clear leader. We offer three affordable authentication service speeds that save you up to 20 days of processing time. Our priority same day authentication service has your documents authenticated the same day they arrive in our office. Our standard 3 business day service balances affordability with speed and our 10 business day economy service is the cost effective alternative when processing multiple documents. Regardless of the service speed you save time and money in the long run. We push through the red tape and personally present your documents to Global Affairs Canada and to the consular section of the Embassy of Peru in Ottawa with minimal delays and guaranteed authentication and legalization for use in Peru. 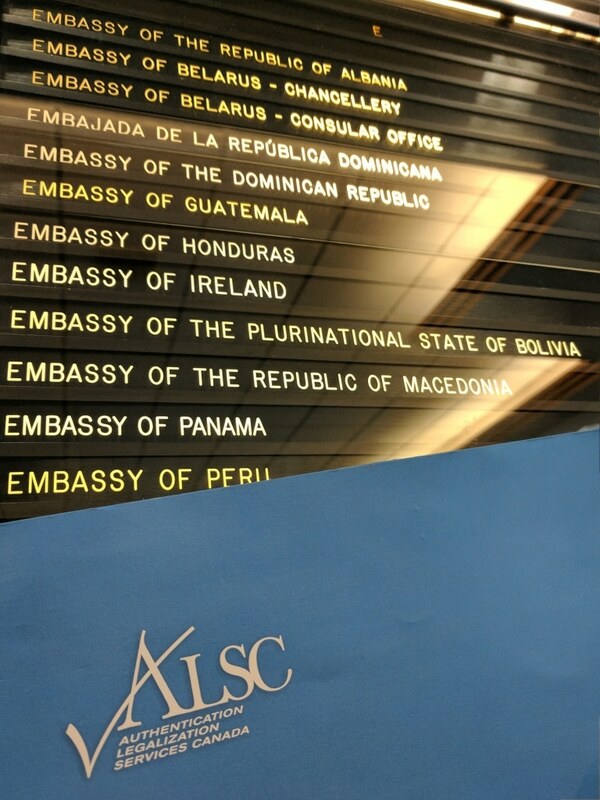 Although we cannot influence the processing time for legalization at the Peruvian consulate, the professional relationship we have developed with their staff and the consular staff of dozens of embassies in Ottawa and across Canada allow us to be the first to know about changing requirements and fees. Our commitment to professionalism and attention to detail also makes us a preferred client to them; we always have our documents and requirements in order and to their specifications. When you become our client you get your own ALSC expert to assist you in preparing your documents and requirements for the process. Once we have received your documents your only job is to sit back while we do the legwork. You will receive detailed updates at every step of the process and our agents will be here to address any questions or concerns you may have. 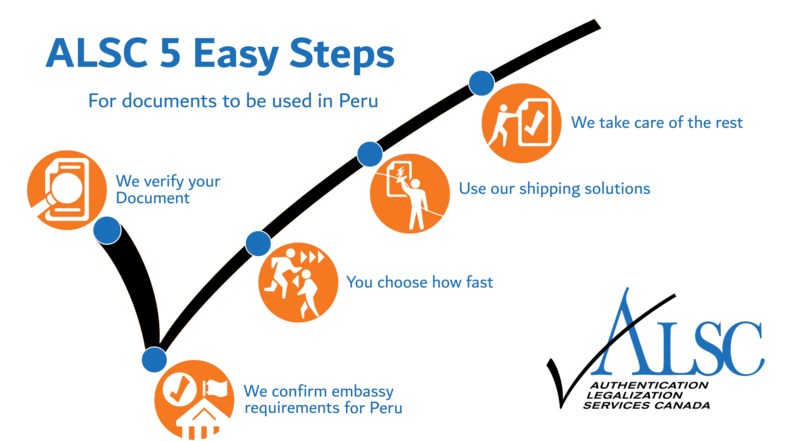 When your documents have been authenticated and legalized for use in Peru we can send them anywhere in the world you would like with one of our many trusted shipping partners. If you have Canadian documents that need to be used in Peru, contact us. Continue reading for some more information on some Canadian documents that are commonly used in Peru. There are a variety of reasons why you may need to use Canadian corporate documents in Peru. These include to expand or modify existing subsidiaries, partner with Peruvian corporations, or sell Canadian products in Peru and these will likely require documents such as a corporate power of attorney, certificate of incorporation, articles of incorporation, manufacturer’s certificate, or articles of incorporation. The exact documents you require depend entirely on your purposes, more specifically which documents the requesting party or affiliate has requested of you for use in Peru. As an existing Canadian company you likely have many of these documents in a readily accessible location or are at least familiar with how and where to get them. To be valid for authentication at Global Affairs Canada, your Canadian corporate documents will require notarization by a Canadian lawyer or notary public. Canadian lawyers can also draft documents such as corporate powers of attorney, which you may already know. If you need documents such as articles of amendment or articles of amalgamation for use in Peru, you can start by filling out the forms found here. If you have your corporate documents notarized and in an accessible location, take a moment to check that the stamp, seal, and signature all belong to the same person and that the name is legible. If they do not match or if the name cannot be discerned, Global Affairs Canada will not authenticate your document. This is a common cause of delay during the process. There are some cases where you have documents that are either too valuable to risk being damaged or lost or very difficult to have reissued. In these cases it is strongly recommended you make notarized copies of your Canadian corporate documents for use in Peru. If you need to do this make sure to check with your requesting party in Peru if notarized copies will suffice for your purposes. Finally, always remember to clarify exactly which Canadian corporate documents you will need for use in Peru to save time and money by processing them all at once. Poor communication is another common cause of delay that can be easily avoided. Once you have your Canadian corporate documents notarized and ready to go, you are ready to use our services to make them valid for use in Peru. Remember that once we have completed your documents you will have to present your authenticated and legalized Canadian corporate documents to the Ministry of Exterior Relations in Lima for superlegalization to make them valid for use in Peru. You affiliates or requesting party in Peru may be able to assist you with this step. Alternatively, you may seek the assistance of a lawyer in Peru to help with this part of the process. Using your Canadian documents in Peru can seem easy. As you have read, nothing is farther from the truth. Authentication and legalization is extremely difficult to do successfully without assistance. There is an extensive amount of planning and organization involved which is in many cases too time consuming to do properly. Like everything else, authentication and legalization becomes easier as it is practiced. However, it is very difficult to practice a process that varies depending on the country in question and is also consistently changing, specifically its requirements, fees, and processing times. As a business, you would have to have an entire department committed to authentication and legalization to do get it done in a timely and organized manner. This is obviously not feasible which is why we exist as the alternative. Dozens of 5-star reviews on Facebook and Google, a proud membership with the Canadian Chamber of Commerce, and an A+ rating with the BBB is proof that we are the best service provider in our industry. Before you go wait in line at the post office to ship your documents to Global Affairs Canada, look and see if you live near one of our many service centers across Canada. If you choose our services, you can drop your documents off at our service center instead of the post office and receive free shipping to our head office for expedited processing via FedEx. Once we have completed authentication and legalization of your Canadian documents for use in Peru, you can choose to pick them up at any one of our service centers across Canada after they have been shipped back via FedEx for free. We can also ship your documents anywhere else in the world at an additional, affordable cost. We know that our services will save you time, money, and headaches; it is the best option in every case. Trust us like thousands of others have and experience a stress-free professional service unlike any other. Click below to get started with the experts in Canadian documents for use in Peru!